Here's the sketch! 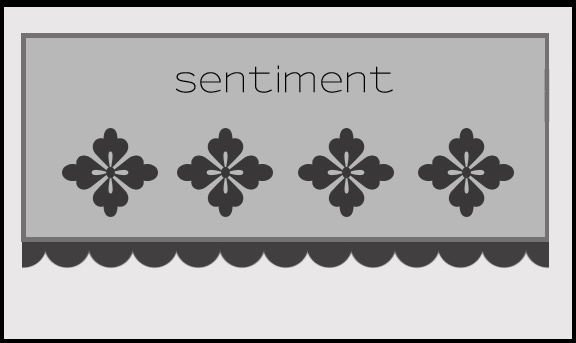 Although I show 4 elements on the card, the idea is to just have a repeated element more than 3 times. I was trying to do something different from the usual clean and simple trio. I made my card 6x3.5. The main panel ended up being 5-7/8x2-1/2. 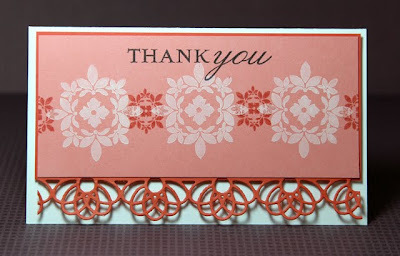 I am really enjoying the Filigree border die from PTI. It really classes up a card. This ended up being a more formal thank you than I intended, but I still like it! I had also forgotten how much I like Melon Berry, Vintage Cream, and Dark Chocolate together. I also discovered that Terracotta Tile makes a nice accent colour with that colour trio. As always, please leave a link to your project! Lovely card. Like the simplicity of it as well as the colors. This is a beautiful sketch!! All of them are, but I really like this one!! four images is a tricky thing -- thanks for the challenge.